Our Project called Tropical Seeds Company started with the firm goal of preserving and maintaining the diversity of Cannabis Sativa L in a world where the local genetics are being lost. In our experience, we feel that things done with special care and love always give the best results. Our seeds are produced organically in small batches which are kept in the best conditions. Every lot is labelled and easy to identify trough a code of its own. We are working hard as to give the best experience when acquiring and growing our strains. This is why we are always in a constant search of the best aromas, flavours and effects. Our main strength is starting with pure – landrace genetics with a whole new world of possibilities, away from the commercial offers. Tropical Seeds Company was first presented publicly in the year 2008. The previous years were intense and harsh as to make the project possible. From the first beginning, the base was chosen to be local – pure strains, being sativas the most numerous. These genetics had proven to be a great psychoactive resource for the locals that had used these plants for long. The final goal was to collect, understand and breed them as to keep alive these lines and make them available to the connoiseurs enjoying the most unique and special effects. Some excellent facilities based on subtropical climate were chosen as to make the project possible. The Canary Islands ( 28º N ) was the place where the charm started. A wide selection of different genetics, coming from the best sources and growers, were spread in some huge greenhouses. 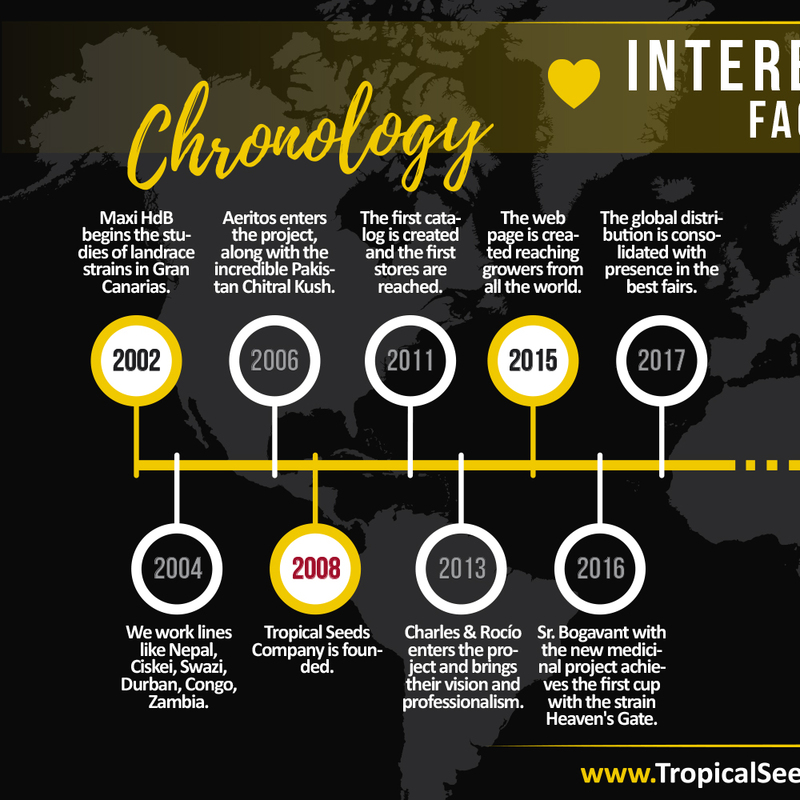 It was Maxi HdB who first started this growing and breeding work, joined by aeritos some years later as to continue with the strength and vitality needed inside Tropical Seeds Company. Tons of dedication and thoughtful work later, once most of the non desirable traits were removed, a visible stock of a renewed genetic reserve arose and created the base to continue the project. Exotic flavours and infrequent highs were already giving refreshing experiences to the smokers. These steps ahead helped Tropical Seeds Company to upgrade into a solid company of the cannabis scene, focused on improving local, pure African strains. 2013 was a year in which a new image was given to Tropical Seeds Company. Charles joined in with his excellent vision on design, arts, photography and marketing. A renewed worldwide platform was created as to simplify the act of bringing the best seeds closer to the collectors of every little spot and country. Nowadays, the seed bank has one of the best international impacts, having customers from more than 30 countries and more that 220.000 visits in their web page, being close to hit the 20.000 likes on Facebook. 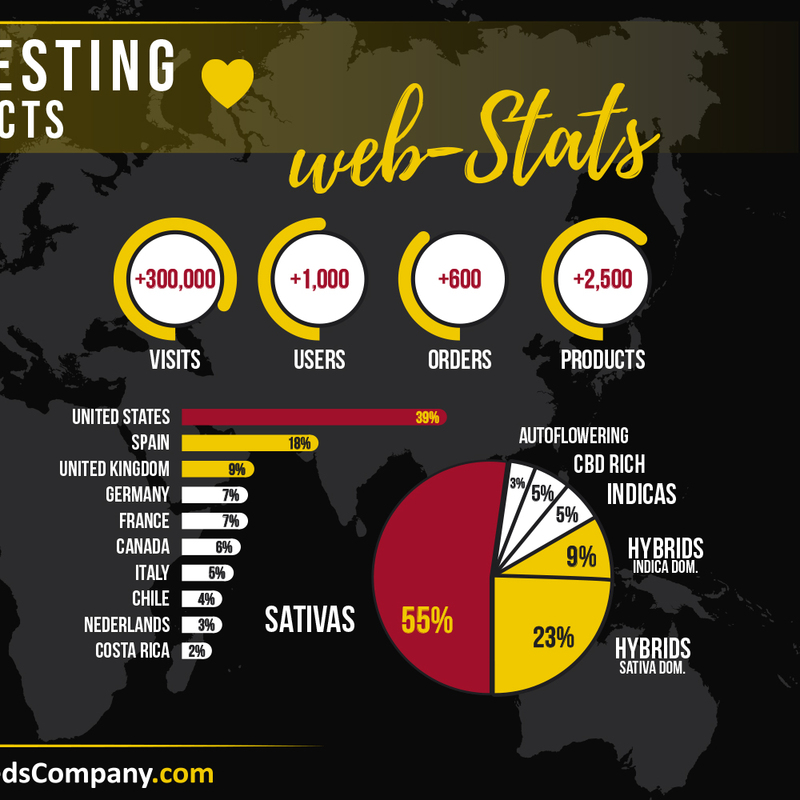 You can easily get to know the crew by visiting the best international cannabis events such as Spannabis. To sum up, Tropical Seeds Company has proven itself successful in providing the professionals with some unique strains, totally different from the rest of offers. To make this possible, an unstopped search of new refreshing creations that will revitalize the scene is always in progress. Pure and unique strains are always chosen as part of the quality process, which is done to the detail in a traditional – handmade way in numerous steps. Getting back to the origins is a part of the final success in creating a glow of quality all around what is offered to the final grower. It is finally them who state repeatedly to have found something unique and different, being a satisfying and inspiring task to grow some Tropical Seeds Company seeds. 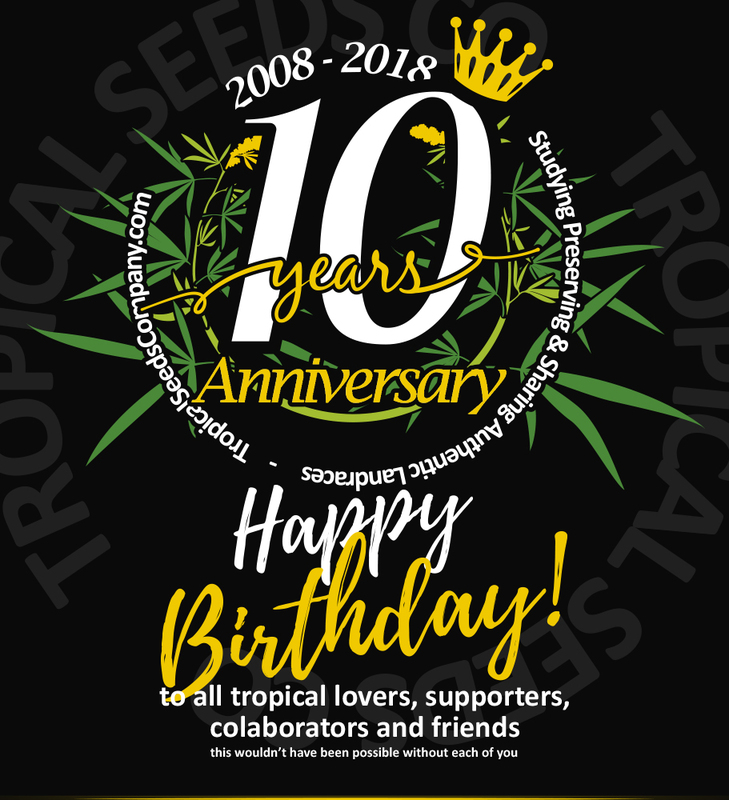 During this year we will be celebrating our 10th anniversary in operation and could not miss all the support we have received from you, for that reason we give you a 10€ discount on your order using the code “10YEARS” throughout the year 2018 . With a firm, disciplined and constant philosophy we maintain our principles to continue studying, preserving and sharing the best landraces strains of the world and for the creation of newhybrids that can give new cultivation experiences that enrich this sector saturated with the few fast flowering strains available. Supporting the natural biodiversity of cannabis and continuing to do work in an artisanal but professional and rigorous way is fundamental for us, as it is the only way to ensure the origin and linage of our strains, as well as the quality of our seeds, undoubtedly enhanced by a 100% natural and organic process. This is our way of giving back to nature what has given us so much. Our philosophy is the second reason why we keep fighting day by day, because the first one is you, so that we can all continue to enjoy for a long time what nature has to offer us.